Typically, when parents hear “allowance”, parents think “spending”. In the worst case, allowances fuel more spending. Thoughtless parents unconditionally shower bloated sums on their entitled kids who rush out to satisfy their “wants” on the latest consumer-driven fads. Instant gratification. Profligate spending. Ugh. In the best case, allowances constrain spending. Modest sums are saved week after week by patient kids who deliberate over their eventual purchases, weighing the pros and cons of each. Delayed gratification. Disciplined spending. Good stuff! Pick a giving goal. Sit down with your child and pick a charitable giving goal that matches her interests and means. Need some ideas? I’ve written about DonorsChoose before here. Your kids can help students in need by helping to fund projects posted by public school teachers across America. Lots of FamZoo families recommend the microfinance non-profit Kiva. Individuals can lend as little as $25 to help create opportunity around the world. 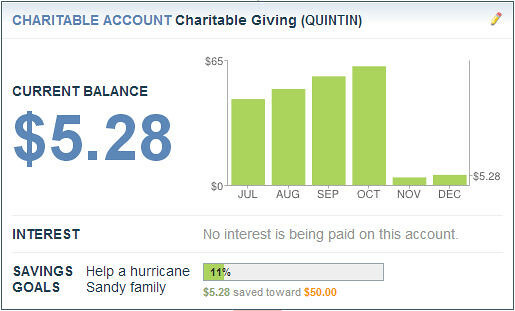 Our kids recently pooled their charitable account funds and made a donation to Sandy storm victims via the Red Cross. In Mark Hurst’s 2013 Gift Guide, I read about a more personal way to reach out to Sandy victims through the organization Family-to-Family. Want more ideas? Check out pick #1 below. Make a fund-raising plan. Help your child work out a gameplan to raise the funds for the donation. Here are a few ideas to mix ’n match: set aside a portion of allowance, tackle some odd jobs, hold a fund-raising event, or convince mom or dad to kick in some matching funds. Track progress. Review progress each week with your child. Fine tune the plan along the way if things are getting off track. Create a memorable giving moment. When your child donates her own hard-earned money to a cause, it invariably creates a strong sense of fulfillment and pride. It’s a powerful moment. Reinforce it. See picks #2 and #3 below for two recent examples of memorable giving stories involving young philanthropists. 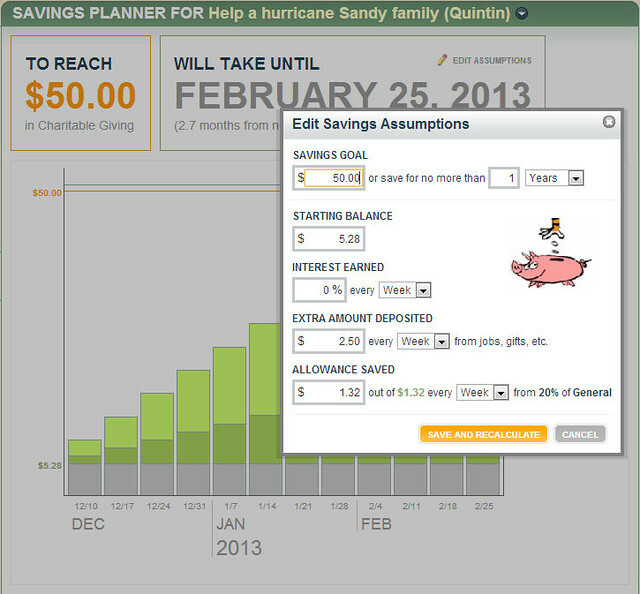 Related FamZoo Activity: Make a family charitable checklist for 2013. I love this story about a 4th grade girl’s generosity with her allowance. A wonderful Thanksgiving story from Neale Godfrey showing how an allowance empowers a child to not only spend, but give. Related FamZoo Activity: Split your child’s allowance as suggested by Neale. When used properly, allowance can be a great tool for helping kids make a habit out of both disciplined spending and thoughtful giving. Good luck and happy giving! We’re constantly scouring the Internet looking for articles related to family finances and teaching kids good personal finance habits. You can visit our ever growing list of family finance bookmarks here. We’re up to 3,024 now! This article is very insightful. I believe it is extremely important for parents to educate their children regarding fiscal responsibility and financial literacy tools at an early age. Lately, children seem to have no concept of the value of a dollar, let alone regularly depositing money into an account for savings in the future. KidsCash aims to set up a virtual bank account for kids using real money, and allowing monitoring deposits by parents. Not only does this site employ a ‘learning by doing’ principle, it also helps parents create a new communication channel for their families to discuss their kids budgeting and spending habits as well as rewarding positive behavior such as saving and donating. It is imperative to educate our youth about finances, banking institutions and saving. Their decisions at a young age, particularly adolescent, affects their adult life and personal finances. Kids can gain a sense of achievement when they regularly deposit and reach a goal, whatever the amount.This sense of achievement can be learned early and maintained throughout their youth as well as adult life. Thanks for your comment Ora. Yes, the stated mission and goals sound good and in line with FamZoo's mission. My concern is that the business model is a function of how much money kids spend in the integrated shopping experience. That creates a natural conflict between the mission and the revenue. 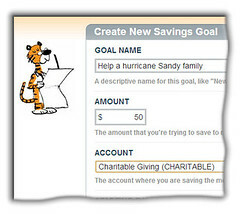 I outlined the same concerns in a recent post about the New York Times coverage of Tykoon here: http://blog.famzoo.com/2012/09/the-new-york-times-tackles-online.html A relevant excerpt: "Ron notes that it can be annoying when the child’s desired purchase or charitable giving target is not in the canned Tykoon store. This gets into a bigger issue of business models and conflicting priorities: if a site’s mission is to help kids learn good spending habits, but the site makes money by getting a cut of every purchase made from the site, a conflict naturally arises between the mission (delayed gratification) and the revenue (which is proportional to purchase volume). That’s why our business model is a flat, transparent subscription fee. When your child learns and exercises spending restraint, FamZoo’s revenue doesn’t tank."